from the brochure "Sorbs/Wends in Germany"
1716 Foundation of the Wendish Preachers Society "Sorabia", which is the oldest student association in Germany today. 1848 "Bramborski serbski Casnik" appears as the first newspaper in the Lower Sorbian language, a forerunner of today's "Nowy Casnik"
1919-1932 The Weimar constitution enables a more active cultural and political life, while on the other hand the Sorbian popular movement is kept under surveillance by the "Wend Division". 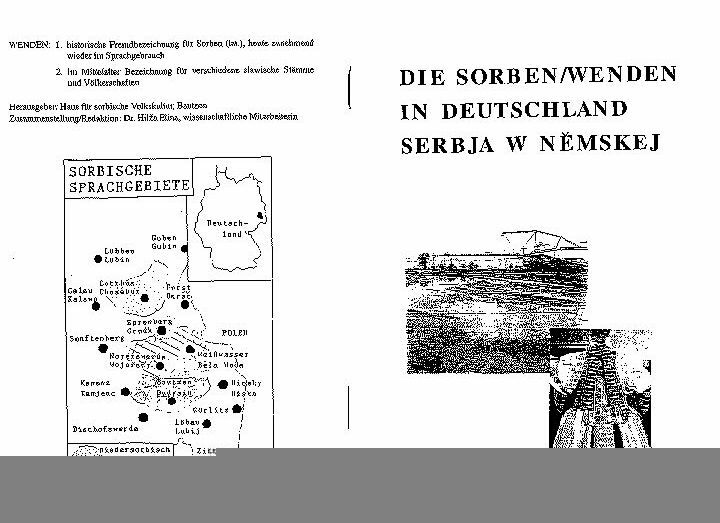 1939 The last publication in the Sorbian language is liquidated with the banning of the "Katolski Posol"
1947 Publication of the Upper Sorbian newspaper "Nowa doba", today "Serbske nowiny"
1948 Saxon State parliament passes "Law to preserve the rights ofthe Sorbian population "
Today's Sorbian national culture is based on the traditional Sorbian national culture of Upper and Lower Lausitz. Sorbs and Germans are particularly dedicated to preserving Sorbian national culture in the genres of music, dance, literature and the fine arts, and Sorbian and German amateur artists have worked closely together to develop this culture. - textiles, painting and ceramics associations, competitions and workshops, continual commissions by the Institute for Sorbian National Culture and a supporting role by the Sorbian National Ensemble continue to preserve and promote Sorbian national Culture. The results of these efforts are outstanding achievements such as the competition organised each year by the Institute for Sorbian National Culture for the most beautiful Sorbian Easter egg, or the diverse range of works by individual artists in the field of national art, which bear comparison with the works of professional artists. An important vehicle for preserving Sorbian national culture for subsequent generations is provided by the festival of Sorbian children's theatre and young reciters and the festival of Sorbian children's songs and Sorbian music, which are traditionally organised by the Institute for Sorbian National Culture each year on an alternating basis. Dance performances, amateur theatrical productions, choral concerts, exhibitions of Sorbian national art and presentation of the customs and traditions of Sorbian ethnic regions by village communities provide groups and individuals alike with excellent opportunities to present their ethnic work. Public organisation with the sole aim of preserving and maintaining traditional and present-day Sorbian national culture. Registered scientific association - established in 1847. This college is affiliated to the Sorbian Centre for Education and Development. Active in the areas of music, dance, literature, fine arts and at the Sorbian folldore centre. The region of the Catholic Sorbs comprises 85 parishes and districts in the areas of Bautzen/Budysin, Kamenz/Kamjenc and Hoyerswerda/Wojerecy. The dominions of Marienstern monastery near Kamenz and the cathedral chapter of St. Petri in Bautzen have been the mainstays for the survival of Catholicism in the region beyond the age of the Reformation and up to the present day. The Sorbs account for well over half the current population of the region. Originally, they lived primarily from agriculture and, to a lesser extent, from pond fish farming. In the small town of Wittichenau/Kulow, which was populated by townsmen who farmed smallholdings, the manufacturing sector then started to intensify, alongside handicrafts. Today, the population lives from agriculture, the surrounding industry and the service sector. fairs or procession around the "Borborka" (Sollschwitz/SulSecy near Wittichenau/Kulow) and the "Miklaws" at Christmas time. The Schleife/Slepo region is comprised of 7 towns and villages, with Sorbs accounting for around one third of the population. Formerly part of the mediatised princedom of Muskau/Muzakow, the Schleife/Slepo area, which is situated to the north-west of Weisswasser/Bela Woda, is similar to Lower Lausitz in terms of language, customs, and indeed the overall character of its national culture. The people of this region traditionally lived from forestry and agricultural work, but today's main employer is the coal mining industry, which has made considerable inroads into the Schleife/Slepo folklore region, and remnants of the glass industry. Spinte (the "Spinte", or spinning room, was an important place of singing for the Sorbian people) or procession around the "dzecetko" in the season of Advent (present-giving ceremony; vanes from village to village). it belongs to the north-eastern part of the Free State of Saxony. The special features of this region characterise Sorbian middle Lausitz. In former times, the population lived from agriculture and village handicrafts. Today, life in the region around Hoyerswerda/Wojerecy is dominated by coal mining. procession around the dzecatko (present-giving) at Christmas time or Christmas singing. The Lower Sorbian region is comprised of over 60 towns and villages, and only a minority of the Sorbs/Wends living in this area are able to speak the Sorbian language. The Lower Sorbian population originally lived primarily from agriculture and fish farming. In Spreewald, part of Lower Lausitz, tourism continues to be an important source of income to this day. Concentrated coal mining operations are today destroying the Lower Sorbians' village communities. - independent traditional costume area (varies for different purposes and from village to village, still worn by some older people, and by the young generation to preserve old customs, traditional costumes are decorated with flat stitch embroidery, which is to be found primarily on skirt ribbons, aprons, neck scarves and parts of the large head scarves; white embroidery is also to be found in charming motifs; a characteristic feature of the Lower Sorbs' traditional costume is the "lapa"
and frog-carting or at Christmas time,"Jansojski bog" visits the children in Jänschwalde/Jansojce near Cottbus/Chosebuz. (1) The capital city of the Free State is Dresden. (2) The state colours are white and green. (3) The state coat of arms shows a field divided nine times into black on gold with a green diagonal lozenge to the right. The further details are stipulated by a law. (4) In the area of Sorbian settlement, the Sorbian state colours and coat of arms,enjoy equal status to the State flag and the State coat of arms; in the Silesian part of the State, the colours and coat of arms of Lower Silesia enjoy equal status to the State flag and the State coat of arms. The population of the Free State of Saxony is comprised of citizens of German, Sorbian and other nationalities. The state recognises the right to live in ones native country. (2) The State guarantees and protects the rights of national and ethnic minorities of German nationality to preserve their identity, language, religion, culture and customs. (3) The State respects the interests of foreign minorities legally resident in the State. (1) The citizens of Sorbian nationality who live in the State constitute an inherent part of the people of the State and enjoy equal rights with the remaining people of the State. The State guarantees and protects their right to preserve their identity and to preserve and develop their traditional language, culture and customs, in particular by way of schools, pre-school and cultural establishments. (2) The necessities of the Sorbian people are to be taken into consideration in regional and local planning. The German-Sorbian character of the Sorbian ethnic group's area of settlement is to be maintained. (3) The cooperation between Sorbs beyond the State boundaries, particularly in Upper and Lower Lausitz, is in the interests of the State. (1) The right of the Sorbian people to protect, preserve and maintain their national identity and their traditional area of settlement is guaranteed. The State, the local government authorities and municipal bodies shall promote the implementation of this nght, in particular supporting cultural independence and contributing towards effective political organisation of the Sorbian people. (2) The State shall work towards securing cultural autonomy for the Sorbs beyond the State boundaries. (3) The Sorbs possess the right to preserve and promote the Sorbian language and culture in public life and to teach the language at schools and nurseries. (4) In the area of Sorbian settlement the Sorbian language is to be incorporated into official headings. The Sorbian flag has the colours blue, red and white. (5) The organisation of the Sorbs' rights is regulated by a law. This law is to ensure that Sorbian representatives are involved in matters concerning the Sorbs, in particular legislation.